Ask Mr. Sage: Does Flowers by the Sea Sell Seeds? I am looking for a specific kind of Tropical Sage seed. The flowers are such a bright red that they make the foliage look like it's on fire. I heard that Thomas Jefferson once grew this plant in his gardens, but I can't think of its name. Can you help me identify this sage and sell me some seed, please? Yes, President Thomas Jefferson once grew Tropical Sage (Salvia coccinea) in his gardens at Monticello. It's still grown there as part of the historic gardens you can tour. We produce a bright red-flowered heirloom variety called S. coccinea 'Forest Fire' that may be the plant to which you refer. It is one of the varieties Jefferson is said to have grown. However, FBTS never sells seeds; instead, we sell Forest Fire Tropical Sage and other Salvias as well-established sets for moderate prices. FBTS is a plant nursery rather than a seed house, which is the term used for the agricultural businesses that produce and sell seed. Seed houses are generally part of deep pocket agricultural conglomerates that can afford the extensive equipment, labs, facilities, test gardens and staff to produce certified seed on a marketable scale. Certified seed results in plants that look like and are true to the characteristics of their parent stock. 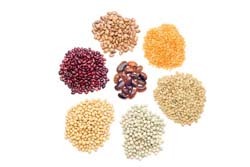 In fact, many of the sages grown by FBTS are hybrids that can't be safely reproduced from seed. They require vegetative reproduction through cuttings. Hybrid seed almost never grows true to its parent stock. Nevertheless, we cultivate Forest Fire from seed instead of cuttings. This is because its seed almost always creates plants that replicate the parent stock -- something that isn't true for many Salvias, including those that hybridized in the wild. Salvias freely hybridize within and across species. Unless a sage is grown in isolation --such as in a special miniature enclosure called a seed cage or at quite a distance from other sages -- it is likely to cross-pollinate with others of its genus. What can I say? Salvias are a randy lot, which makes it extremely expensive and labor intensive to produce certified seed. Beware when purchasing from small companies that may unknowingly supply Salvia seed contaminated by other varieties or species. Seed saving is a popular hobby for vegetable and flower gardeners alike. It is something we do, although we never sell the seed. If you would like to try it, the How to Save Seeds website provides a detailed explanation of the steps necessary to make sure that the seeds you save grow true to type. If you have more questions about Tropical Sage, seed saving or any of our hundreds of plants please call or write. We're here to help.